I opened ‘Places We Swim’ to review one Saturday morning, one of those January days that is so grey you feel like you are walking through thick, oppressive fog. The sky was so low it was practically grounded. January is a hard month no? All the lights and bustle of the holidays are over, we are back at work, and things seem dark and rather dismal. I might not be going to Australia anytime soon, but it turned out to be a wonderful read at this time of year: full of light and sunshine, clear turquoise water and the promise of ice cream. Places We Swim is a guide to the 60 best places to swim in Australia. But it is not just that, it is also (as the authors write in the introduction) “a celebration of Australia’s incredible landscape, both natural and built… a celebration of the Australian experience.” It works both as a book for your coffee table and for planning an Australian swimming trip. 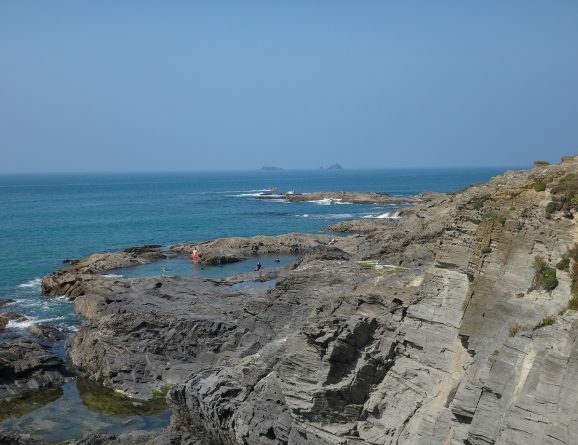 As well as 60 swimming spots there are sections with interviews and profiles of, local people and swimming organisations: a chef, a lifeguard, a swim instructor, a lifesaving society, a travel and lifestyle photographer. These people add vibrancy and life to the pages, providing the human aspect of life in Aus. I loved the interview with Sarah Scarce, an immigration lawyer who now runs a programme called Aqua English. 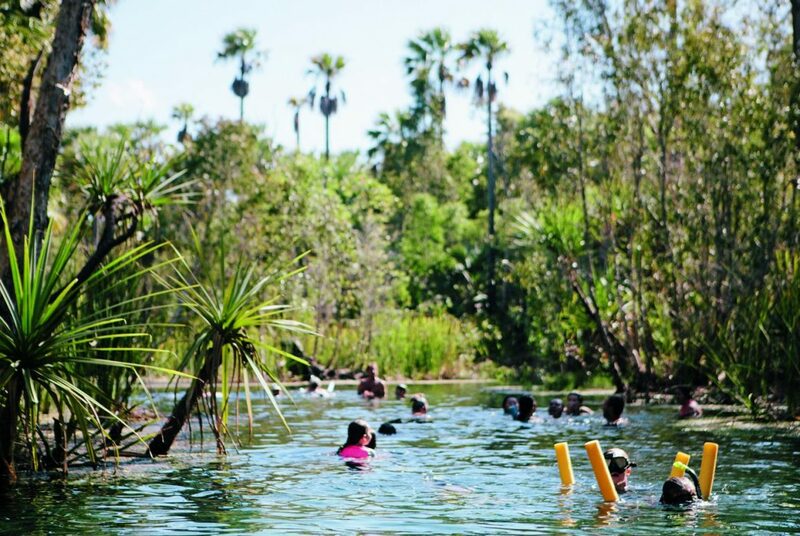 This programme teaches refugees and other second-language English speakers to swim around Brisbane and the Gold Coast. 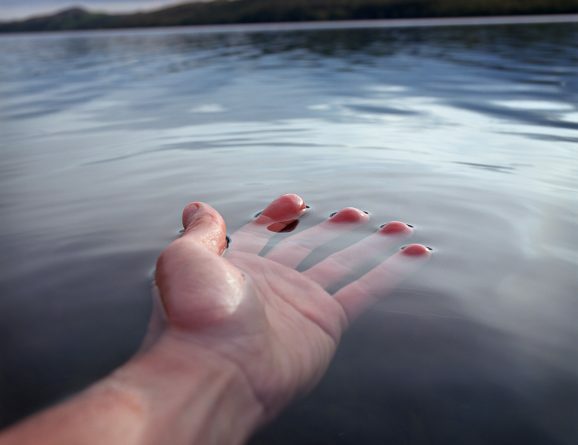 Sarah began it after discovering that the primary victims of drowning were ESL (English as a Second Language) speakers and she set about changing this statistic. 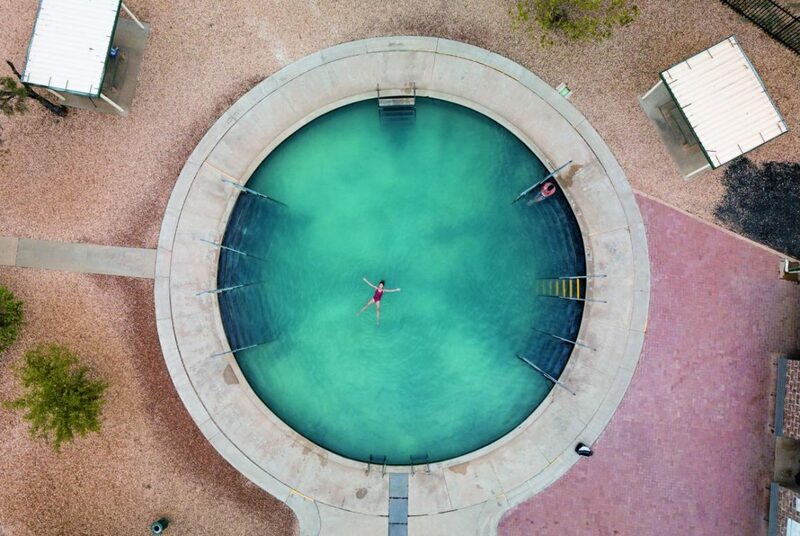 Equally compelling is the story of the Remote Aboriginal Swimming Pools Project that has installed pools in various regional locations, where the pools have become focal points in the communities. The pools provide safe spaces for children to be after school, and are hubs for community cohesion. 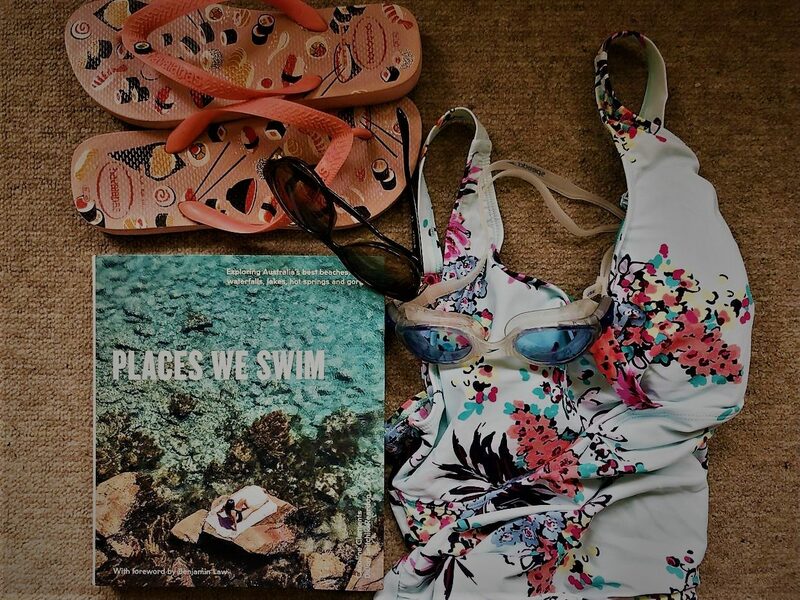 In terms of swims, the book is divided into swims by state, so that if you are going say to Sydney, you can view all their recommended swimming holes in New South Wales in the same chapter. And if you thought these would be mainly beach swims, you would be wrong. The book includes some glorious-looking inland swims like Lightning Ridge Bore Bath (p.10), Bitter Springs (p. 122), and Hamersley Gorge (p.96). 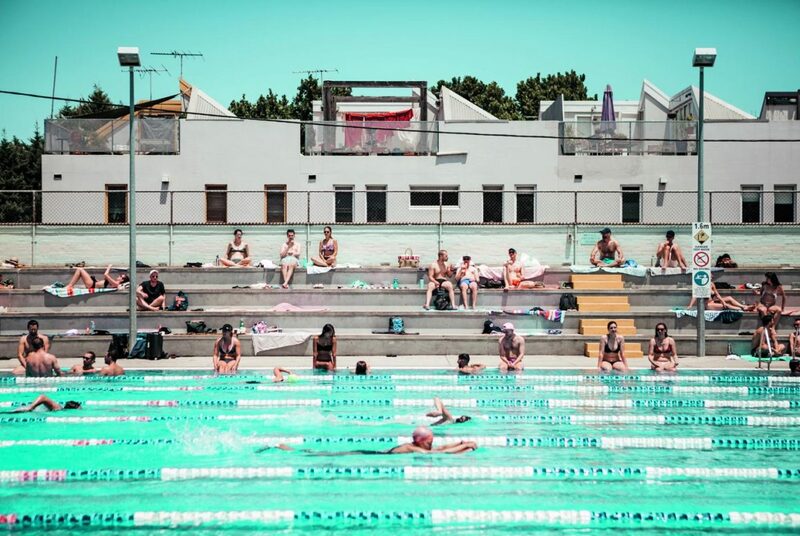 City pools get a shout-out too – Melbourne’s Fitzroy Pool, Sydney’s Bondi Icebergs, Darwin’s Nightcliff Pool, and Brisbane’s Centenary Pool are all featured. 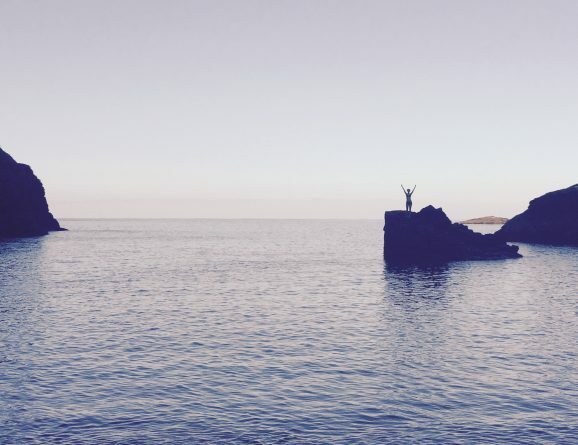 There is a wealth of useful information within the pages of Places We Swim– not only swim locations but the best times to visit, the type of access the swim has, costs, whether it is child and/or dog friendly, the facilities it offers, and what you absolutely have to bring with you on your adventure. Additionally, each swim has a list of nearby cafes, restaurants and bakeries to fuel your post-swim hunger. The chapter on the Northern Territory includes some useful advice on crocodile habitats in Australia, including best practices for swimming in places where either fresh- or salt-water crocodiles live. Unexpectedly wonderful. Whether you are looking to book a trip to Australia featuring expeditions to beautiful swimming places, or are simply wanting to feed your imagination with gorgeous images and stories, Places We Swim is recommended.